All Thumbs Reviews: Ever need an idea for Date Night? Ever need an idea for Date Night? This is a guest post by JJ of Reproductive Jeans. Beware, readers. Your salivary glands are about to go into overdrive. And make sure to read all the way to the bottom. There may be something in it for you ;-). Looking for a yummy meal for your next Date Night? There is a place of pure heaven right here on earth. It's made up of cheese, meat and chocolate. That might not be your idea of heaven, but it sure makes me want to slap on a pair of angel wings. This place is known as The Melting Pot. A deliciously wonderful fondue restaurant that started in Maitland, FL in 1975 and has pleased its customers in 38 states ever since (US only, I'm afraid). Mook and I are fortunate to live 20 minutes away from a franchise, and with the approach of any special occasion (my birthday, anniversary, etc.) I put in a request for a night of fondue! Be sure to call ahead for reservations. 1st Course: CHEESE, my personal favorite. There are quite a few varieties to choose from: swiss, cheddar, nacho, plus more. My choice is always cheddar -- it is a perfect match for all sorts of bread, apples and veggies, all which are bottomless. Get as much as your tummy can hold--but save room because there's more to come. 2nd Course: Salad. This helps to cleanse your palate before the next course comes. You can choose a house salad or the specialty salad which changes from time to time. 3rd Course: The Entrée. Here's where it can get overwhelming. You choose a cooking style, the medium in which you want your meats cooked. Choices include a bullion base and other fancy bases with wine and other flavors. The bullion base is quite tasty and really draws out the flavor of your meat. And what are your meat choices? Filet mignon pieces (my favorite), teriyaki chicken, lobster, shrimp, and more. You can get a combination or you can get just one kind. The price goes up based on how many meats you order. Along with the meats, you are served numerous dipping sauces. All complement the meats and veggies you cook in the pot. The most famous sauce is the Green Goddess, a mix of sour cream, cream cheese and spices (I usually ask for 2 ahead of time, since I know I'll go through it). Cooking time for the meats is at least 2 minutes in the bullion. The veggies and sauces are bottomless, but unfortunately the meat is a one serve only--but trust me, it's enough. 4th Course: Oohhh, the chocolate. Make sure you save room because you cannot leave without this course. Choose from dark chocolate, milk chocolate or white chocolate, with yummy accompaniments like Oreo bits, nuts and caramel. A few of the signature pots of chocolate are s'mores or yin and yang, a mix of white and milk chocolate. Mook likes the specialty order, adding peanut butter. For dipping, you get marshmallows, bananas, strawberries, cheese cake, brownie bits, and pound cake. There's no way to go wrong with any of these. This sweet treat really tops off the meal. You are not required to order all four courses. Sometimes I'll go in with my girlfriends and just get cheese and chocolate. The Melting Pot also offers great drink specials (such as for Ladies Night) and has a wide wine selection. For a full course meal, alcoholic drinks and tip, be prepared to pay around $50-$100 a person, but remember you can customize this according to your appetite and your budget. My thumbs are up, wanting to go back again and again. Have fun dipping and eating! The generous folks at the Melting Pot are providing a yummy giveaway. The lucky winner will receive a Melting Pot Gift Pack which includes chocolate bars and salad dressings and has an approximate value of $25. The Gift Pack will be mailed directly from The Melting Pot. To enter, comment below (on this post) by leaving the names of three items previously reviewed on All Thumbs (the Melting Pot can be one of them). Enter (one per person) by 9:12 am on September 12. One of my children will draw a number, and the commenter associated with that number wins. Winner will be notified by email, so make sure I can find it. By commenting on this post you agree to the terms and rules of this giveaway and you consent to letting us use your name (bloggy or otherwise) when we announce the winner. Anonymous comments and comments without a valid email address will be disqualified. I LOVE the Melting Pot. I don't live near one anymore, but I used to and went all the time. Sounds yummy! I would enter but I don't think the DH has the patience for it. I LOVE the Melting Pot. I am a big melty cheese freak. Oooh!!! That's our favorite anniversary spot. DELISH! I'm actually entering this one because my friend loves the Melting Pot. So I would send the love her way--it would make her day. Three items have been the gourmet M&Ms (all 35 pounds of them), Melting Pot, and Farecast. Melting Pot, Farecast, and Propel Fitness Water....that's three of 'em! YUMMMM!! !Haven't been to Melting poy in years. 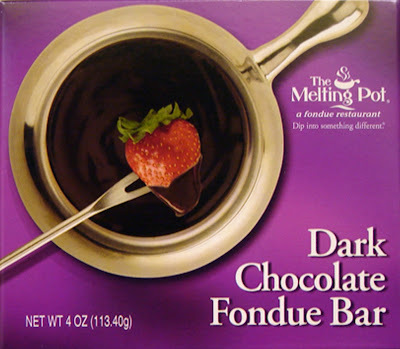 I've only been to the Melting Pot once -- but it was SOOOO good! I'd love to go there again! If we win the prize, do we have to eat the salad dressing with the chocolate? Haven't ever been there, but I'd love to...Sounds unbelievably yummy! Long Way Gone, First they Killed my Father, and Duffy!!! I am a melting pot virgin... :( so sad. I love the Melting Pot! We have gone a few times for special occasions. Pricey, but VERY worth it! I love the Melting Pot. We have one just a little bit away from us. Sigh... 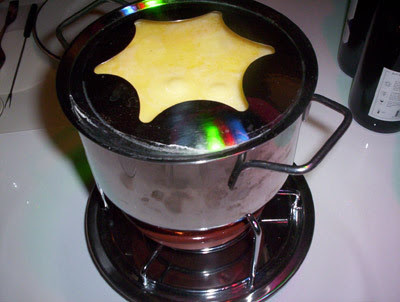 I could use a huge pot of fondue chocolate right now. AF is still dragging along. Grrr! Sounds yummy. We don't have one near the middle of nowhere, though. Just to reiterate, we are only able to include entries that list 3 items we've reviewed. Cassandra: Yes. The Gift Pack comes with surveillance equipment to ensure that you mix the salad dressing and the chocolate. Melting Pot, gourmet M&Ms, Farecast. All of those seem very appealing in their own way. Melting Pot, Farecast, and Propel Fitness Water! Oooohhh, I sure hope we win!!! Propel, Melting Pot, & Premium M&Ms. MMM...love the Melting Pot. Went a couple of months ago for a rare date night. Melting Pot is the greatest!!!! Propel, Farecast and Melting Pot! Got the package today. it looks delish. Can't wait to give it a try.